Story (aired on September 13, 2007/written by Chris Provenzano & Matthew Weiner, directed by Paul Feig): Betty begins the episode dressed elegantly to attend the opera, and she ends it with a cigarette perched between her lips, firing a gun at the neighbor's pet pigeons (they provoked a confrontation with the neighbor and her children the other day, and she's not having any of it). After an absence from the screen, this is certainly Mrs. Draper's most prominent episode since the second, and by far her most compelling and well-developed turn. She is enmeshed in a corporate conspiracy targeting Don, if "targeting" is the right word for such friendly overtures, and "conspiracy" is the right word for such unsubtle recruitment. The poacher is Jim Hobart (H. Richard Greene) and he sets his sights on bringing Don to McCann Erickson, a swanky New York advertising firm (he calls Sterling Cooper "Mom and Pop") with its prestigious clientele, cushy office, and impressive perks. Gifts - or bribes - include an implicit invitation to a top-shelf sauna where all the bigwigs gather to relax, socialize, and do business; a golf bag fully stocked with shiny new clubs; and, in the most ambitious and dangerous move of all, an offer for Betty to resume her long-dormant modeling career as part of McCann Erickson's Coca Cola campaign. Betty glows with this new purpose and Don is moved and cheered by her excitement. When Mr. Hobart sends him the photos from the shoot, however, Don looks troubled - something isn't right. Does he feel disdain toward the supposedly posh firm's grasping tactics? Is he suddenly troubled by the use of his wife as a pawn between two bemused powerbrokers, himself being one of them? Is he moved to pity by Betty's vulnerability, so desperate to recapture something she's lost yet so subtly unsuitable, even vaguely embarrassing, in this attempt? Don doesn't say, simply proceeding to re-negotiate his position with Roger (higher salary, no contract), and turning Jim down with the firm but needling remark, "Can't exactly say that was a big-league move." Betty takes it in stride when she's told the work has "moved to Paris" (she cries, but then lies to Don about her reason for not further pursuing a modeling career). Don consoles her by praising her skill as a mother (a completely sincere compliment given his own upbringing) but the next morning she trades Grace Kelly for a touch of Kate Hepburn and, in the title's punning formulation, shooting photos for shooting birds. For that matter she trades being shot for shooting. Her dreams have been at least temporarily dashed, but she has emerged with renewed confidence (even asserting herself against her condescending shrink) and we emerge with a stronger sense of her identity. It's amazing how a little context can change things. Throughout the first season, Sterling-Cooper has seemed casually chic, glamorous, polished in a particularly early sixties way. If some of the lower-ranking guys chafed at their grunt work or resented their place in the pecking order, Don at least seemed to have it made with his view of the city, casual relationship with superiors, and the general acclaim that met his work. But as soon Jim Hobart sneers at the the office, the scales fall from our eyes. Suddenly it does seem kind of chintzy and tight-quartered, the unprofessional laughter of men barely out of fraternities chasing Don as he crosses the floor, the casual familiarity of executives a mark against the company's seriousness, even the presidential candidate-client unimpressive in his cloth-coat dourness (will Kennedy end up with McCann Erickson?). 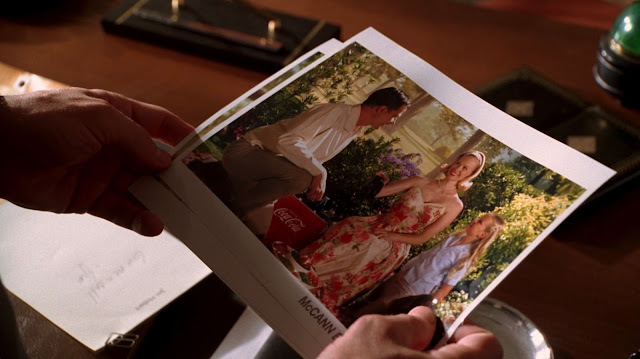 If this awareness actually fuels our affection for the show's primary location, we are also well-aware of why Don is so attracted to the tasteful largesse of the beckoning rival: our only glimpse of McCann Erickson is the owner's office but it's enough to impress us, to make us feel like we're floating on a cloud. Meanwhile, learning Betty's background, and sharing a storyline that takes her out of the smug, resentful suburban bubble she's been mired in for a while, does wonders for a character I'd been growing to dislike. At times it felt like the writers didn't really know what to do with her (with the directors following suit), but here she really hits her stride. 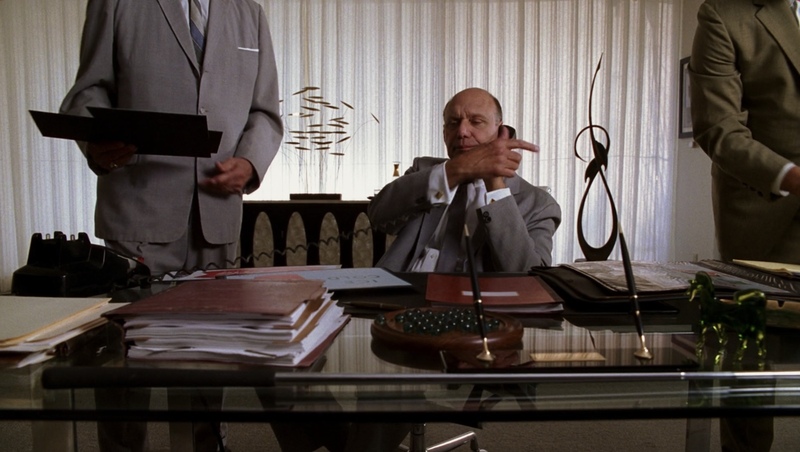 It also probably helps that this is Paul Feig's introduction to Mad Men. The creator of Freaks and Geeks, and director of many 2010s female-led comedies including Bridesmaids, The Heat, and Ghostbusters, he has a way with quirky but genuine character development, and an empathy for underdogs trying to find their way in the world. He even manages the miraculous feat I swore would never happen: when Pete, increasingly on edge as his co-workers mock Peggy's appearance, finally snaps and belts Ken for one insult too many, I must have loudly cheered. (Peggy, meanwhile, has a defiant moment of her own, telling off the ever-snippy Joan.) I'd certainly be cautious about lauding Pete's motives, but it's still refreshing to watch him throw caution to the wind and care more about defending the awkward, good-hearted Peggy than fitting in with the braying crowd. While this chauvinistic chivalry is deeply bound to his own pride rather than genuine compassion, this is the most human he's even seemed. Next: "Long Weekend" • Previous: "The Hobo Code"